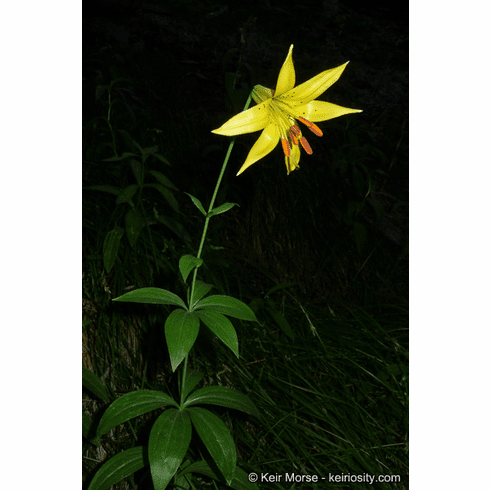 Named in 1924 after Robert Kessler, a Los Angeles lily enthusiast, the var. kessleri is distinguished by its wider leaves and by its more open trumpet. It is found near Los Angeles, California in the San Gabriel Mountains. Overall it is a much more forgiving subject in the garden of the two variants. Its main distinguishing feature are the broad, ovate-lanceolate leaves this variant produces. This variant is also found at the most northernly portion of L. parryi's range. This variant is reported to have first been discovered growing in a potato field by Parry near San Giorgio Pass. Title photo copyright Keir Morse, all rights reserved. Source CalPhotos. This image has a Creative Commons Attribution-NonCommercial-ShareAlike 3.0 (CC BY-NC-SA 3.0) license. L. paryii var. kessleri found in the San Gabriel Mountains near Los Angeles. The photo of var. kessleri copyrighted Keir Morse, all rights reserved. Source CalPhotos. This image has a Creative Commons Attribution-NonCommercial-ShareAlike 3.0 (CC BY-NC-SA 3.0) license. The photo of L. parryi type copyrighted Thomas Stoughton, all rights reserved. Source CalPhotos. Used with written permission.